JASON MOMOA is one of Hollywood's most exciting up-and-coming leading men. After much speculation, it was announced that Jason would play the iconic superhero "Aquaman" as part of Warner Bros' massive expansion of DC Entertainment properties, including JUSTICE LEAGUE and an AQUAMAN stand-alone spinoff. It has also been announced that Jason will be starring as the lead of the new Netflix action/adventure series FRONTIER, produced by Jeff Fierson and Brad Peyton (SAN ANDREAS), with Peyton also directing. 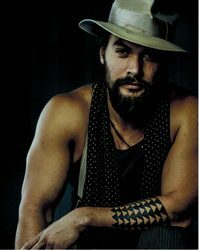 He will soon be shooting the action-thriller BRAVEN, directed by Lin Oeding, which Momoa is producing under his Pride of Gypsies banner. Earlier in 2015, Jason wrapped production on THE BAD BATCH directed by award winning writer/director Ana Lily Amirpour and produced by Annapurna Films. He will be appearing in the upcoming Voltage Pictures comedy feature GOING UNDER, opposite Bruce Willis and John Goodman. As a director, Jason's talents were showcased in ROAD TO PALOMA, a road-tale character-driven thriller shot throughout the American Southwest. Jason co-wrote, co-produced, directed and starred in this independent project which was distributed by Anchor Bay. Jason has also appeared as the title character in the LionsGate/Millenium Films reboot of CONAN THE BARBARIAN and opposite Sylvester Stallone in Warner Bros BULLET TO THE HEAD. In television, Jason starred on the acclaimed Sundance Channel drama THE RED ROAD and previously played an integral role in launching HBO's ground breaking, Emmy-nominated GAME OF THRONES with his amazing performance as Dothraki warlord "Khal Drogo."